The US aviation regulator said it would not ground the planes and that a review "shows no systemic performance issues and provides no basis to order grounding the aircraft", but will "take immediate and appropriate action" if issues are identified. The company said it remained fully confident in the aircraft. Mechanics' union TWU has urged the company's chief executive to ground MAX 8s. The British overseas territory's aviation authority said it prohibited MAX 8 and MAX 9 aircraft from its airspace. Canada has no plans to ground the MAX 8 aircraft but is ready to "act immediately" to suspend flights if new information emerges indicating there is a problem, Transport Minister Marc Garneau said. Air Canada, which has 24 MAX 8s in its fleet, said it cancelled four flights this week due to the UK Civil Aviation Authority ban on MAX jets. WestJet, which operates 13, is monitoring the situation. The South African airline said it would remove 737 MAX 8 jets from its schedule. It has ordered eight aircraft of this type but has only received one. The European Union's aviation safety agency has suspended all flights in the bloc by 737-8 and 737-9 airplanes. The company's chief executive officer said Boeing should ground all of its 737 MAX 8 jets until it is established that they are safe to fly. The airline and the authority temporarily grounded the carrier's two 737 MAX planes, saying they had confidence in the model's airworthiness but would suspend flights out of deference to public concern and regulatory action around the world. The regulator suspended MAX aircraft from flying to or from the country, saying Fiji Airways would be the only airline affected. Singapore's Civil Aviation Authority suspended operations of all Boeing 737 MAX aircraft in and out of the country. Singapore Airlines said its unit Silk Air, which operates 6 MAX 8 planes, has temporarily withdrawn them from service. South Korea said it is conducting an emergency inspection on Eastar Jet's two MAX 8 jets. Budget carrier Eastar Jet said it would temporarily ground its two 737 MAX 8s from Wednesday. The US airline said it remained fully confident in the aircraft and was closely monitoring the investigation. The EU's suspensions of all flights by Boeing 737 MAX 8 is also valid for Switzerland, the Swiss federal office of civil aviation said. The regulator said it is suspending the use of the Thai Lion Air's Boeing 737 MAX 9 for seven days due to safety concerns. Germany's TUI Group, the largest leisure, travel and tourism company in the world, said it was discontinuing all Boeing 737 MAX 8 flights. 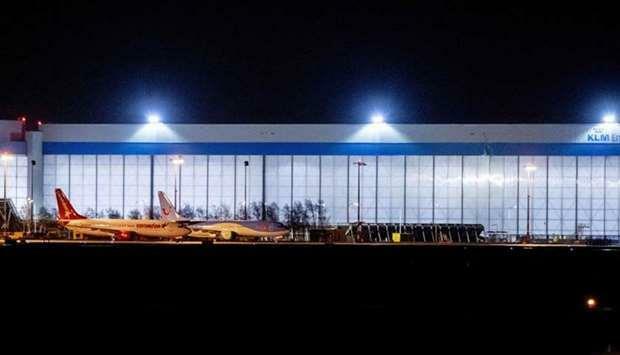 Uzbekistan's civil aviation agency on Wednesday barred 737 Max jets from taking off or landing at local airports for one month.